The Marisa Perry Radiant cut diamond three stone engagement ring with Pear shaped diamonds is as sophisticated as it is timeless. 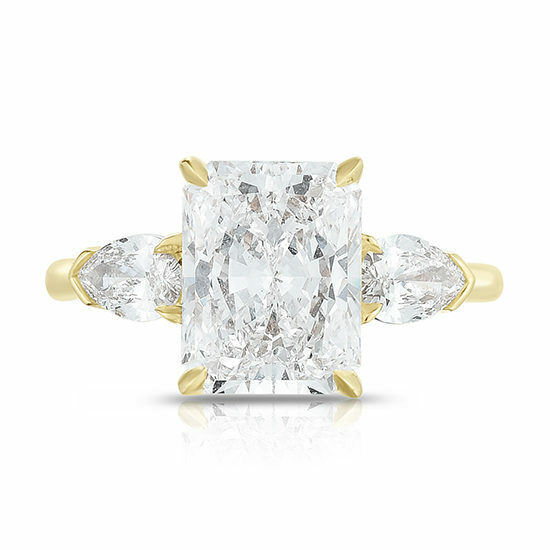 It features a 2.30 carat F color VS1 clarity rectangular Radiant cut diamond with two colorless VS clarity Pear cut diamond side stones totaling 0.44 carats set in 18K Yellow Gold. With your personal style in mind, haute jewelry designer, Douglas Elliott, uses cutting edge design techniques to create a ring that is more beautiful, sleek, and refined than any other traditional three stone ring. Bespoke Custom Design Services for this ring start with approximately a 1.00 carat diamond or precious gem center stone. This setting is meticulously sculpted in platinum, 18k yellow gold, or 18k rose gold. Made in NYC. Please contact us to schedule an appointment with a diamond specialist and explore the different options available to you. We look forward to creating your perfect ring.